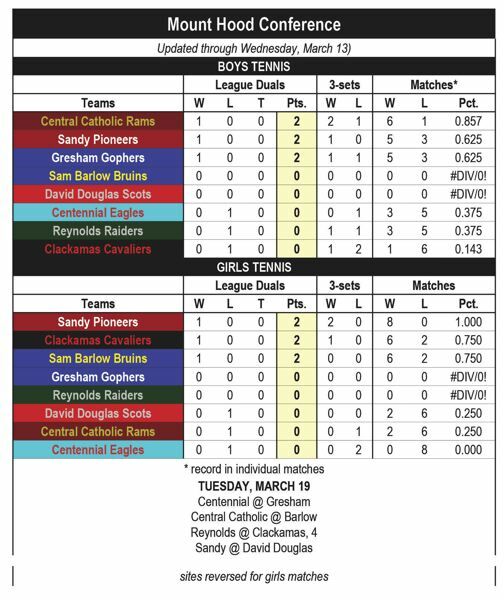 The last match on the courts decided the team winner in Sandy's 5-3 victory at Centennial to open the Mount Hood Conference boys tennis season Wednesday. Centennial's Austin Le hit a serve to the outside, which forced Sandy to move wide of the court for an errant return that sent the No. 2 doubles match into a third set. Sandy's senior duo of Talati Polamalu and Nolan Johns regained command by taking the first three games. Centennial tried to climb back into contention when Le whipped a forehand winner down the alley, followed by a backhand winner cross court. The Pioneers would reel off the next four points, largely of Centennial miscues, to break serve for a second time. Le tweaked his shoulder for an injury delay as the team's approached match point, but that was all that would slow down the Sandy pair of their way to the 6-2, 4-6, 6-1 win. 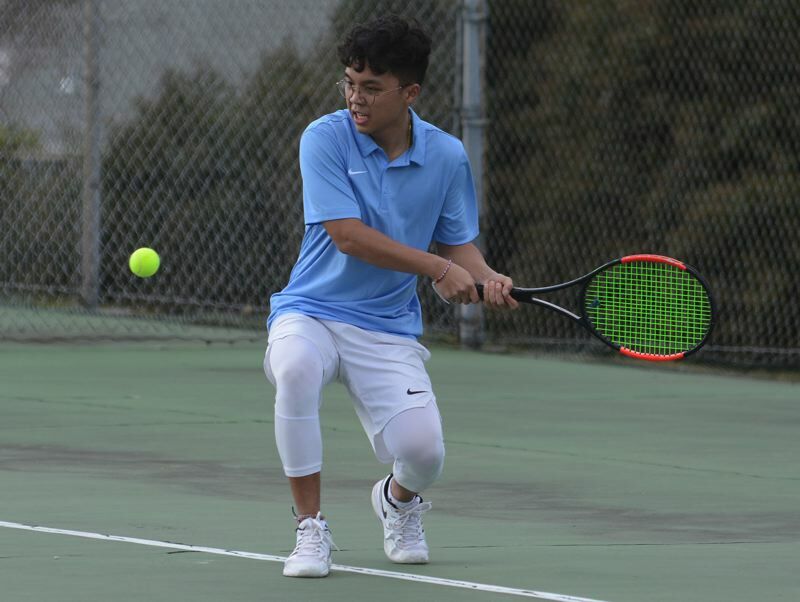 Centennial held the upper hand on the singles courts with Timothy Fu, Thomas Moua and Jayden Benologa all winning in straight sets. 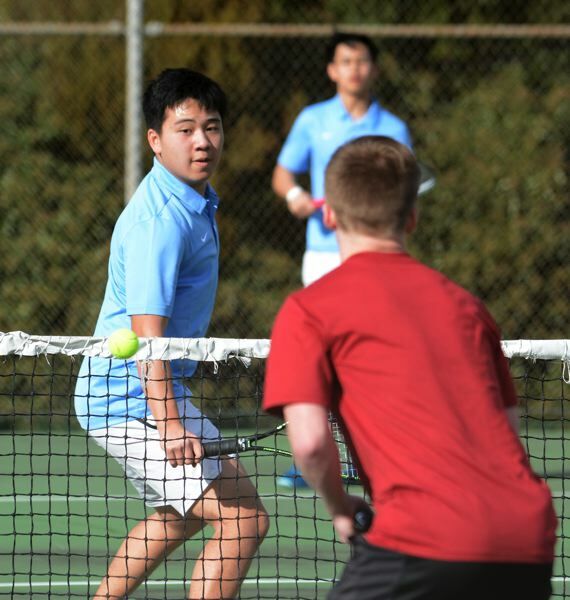 Sandy's Ethan Chang, a transfer from Parkrose, pulled out of pivotal early win 6-4, 6-1 in No. 1 singles. After falling behind early in the first set, he claimed 11 of the final 13 games. "I was rusty being the first match of the season, so it was just a matter of getting back into the motion," Chang said. "I won that first set and just kept pushing on him." Chang highlighted his play with a back-to-back blasts that drove his opponent into the back corner, leaving the court open for a forehand winner that brought up double set-point. Chang would emerge from a 12-hit exchange to take the set. Sandy finished with a 16-game advantage across the eight matches.